At Talking Dog Studios, we’ve always been futurists, striving to be on the cutting edge. These technologies are great to help your business stand out and are a great marketing and advertising investment. We’ve worked with ad firms, brands and museums to create projects that create an exciting, engaging experience that educate and grab attention. Since 2009 we’ve been industry leaders in the fascinating world of AR: Godzilla fanboys worldwide will remember the crazy AR-animated T-shirt we created for Legendary Pictures’ booth at the 2010 Comic-Con. The t-shirt showed an artist’s rendition of how the movie monster was going to appear in what was to become one of 2014’s biggest films. Now, ARCore and ARKit are giving us new and even more powerful tools for creating fantastic augmented reality experiences where the line between the real and the virtual is increasingly nebulous. Adding physical effects for a mixed reality experience – such as the ones we’ve created for the RCMP or for SaskTel – opens up the possibilities even more. We made VR projects for the likes of the RCMP Heritage Centre, Worksafe SK, Tourism Sasktatoon, Sasktel, and The Grid VR Arcade. Our projects have been on all the major VR systems (Oculus Rift, Gear VR, HTC Vive) and used for experiential marketing and education projects. We’ve also been industry leaders in 360 video photography, beginning in 2015 when we travelled to Ottawa to shoot the world famous RCMP Musical Ride using multiple 360 camera arrays. In the past year we’ve co-produced and created the fully spatialized audio (second order ambisonics for you techies) for three VR films starring Wesley Snipes, Nicolas Cage, and Christina Ricci / John Cusack. Tourism Saskatoon, the Saskatchewan Cattlemen’s Association, Manitoba Beef, and the RCMP Heritage Centre have all had successful campaigns featuring phone-based VR experiences with 360 video, 360 audio and interface programming by Talking Dog. Some of our experiences feature not AR, not VR, but MR: Mixed Reality. For instance, in 2016 when we built a new Virtual Reality installation for the RCMP Heritage Centre, it used the Oculus system to play 360 videos we had shot the previous year in Ottawa, showing the world famous Musical Ride from an amazing perspective – as one of the riders executing the complex choreographies of their presentations. 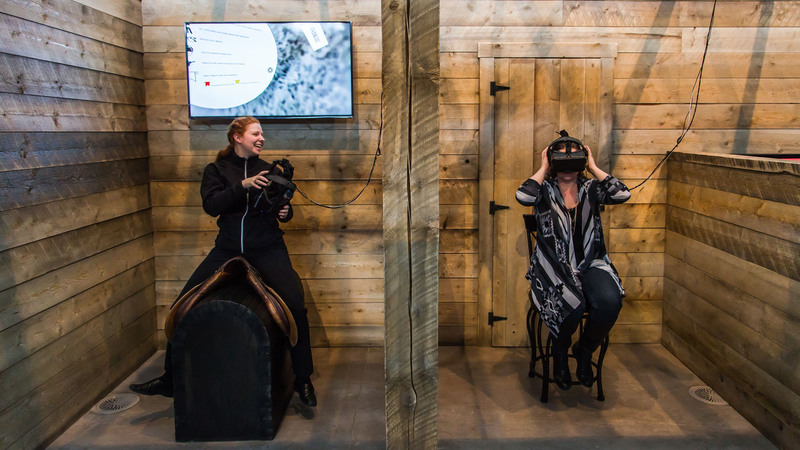 Visitors to the Heritage Centre can now climb onto a saddle, put on the headset to see themselves riding a horse and – here’s the mixed reality part – a physical device provides the deep horse hoof thumps coming up through the saddle in sync with the actions of the horse the visitor sees themselves riding.